Srinagar, Indian-administered Kashmir – On a wintry November morning in Srinagar, the largest city in Indian-administered Kashmir, Mohammad Abdullah sits on the carpeted floor in his living room, with a black and white portrait of his father, Haji Abdullah Karem, hanging on the wall. Abdullah says his forefathers had trekked the same route, travelling in caravans on top of horses and double humped camels, stopping at the sarais – resting stations for travellers – on the way, bartering silk, spices and pashmina fine cashmere wool. 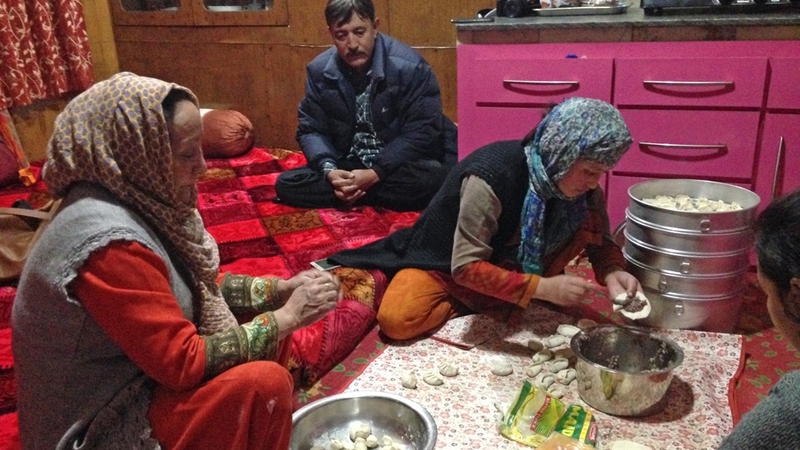 One such journey to Ladakh located inIndian-administered Kashmir in the 1940s would turn fateful when Karem could not return home after the People’s Republic of China took over Xinjiang in 1949. The Communist government blocked the mountain pass, eventually choking off trade. Abdullah, 60, who works for the regional government, lives with his family members in the Rajbagh area of Srinagar, which has remained untouched by the months ofdeadly anti-India protests that gripped the Muslim-majority Himalayan region. 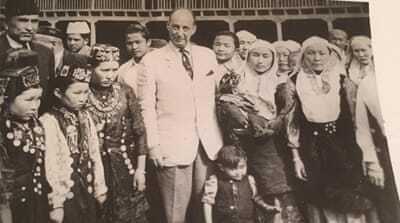 One of the few relics of the past left with the family is Karem’s portrait – an imposing looking man wearing a doppa – a Uighur skullcap, squinting his eyes as if shielding himself from the sun. In 2014, a devastating flood ravaged Srinagar. Their house, along with others, was not spared. The deluge swept away precious memories, but they managed to save Karem’s original passport issued by the Republic of China, along with a woollen Khotan traditional rug and a copper vessel used by the caravan on the Silk Road to cook mantou steamed dumplings, both of which have been in the family’s possessions for nearly two centuries. “In our hearts we are as Indian as can be. Although, we would really like to visit Xinjiang once to see our ancestral land,” says Abdullah’s son, 32-year-old Wasim. He spends part of the year in Leh, where he is building a resort, and part of it in Srinagar. Abdullah’s dialect is a mix of Urdu, Ladakhi and Kashmiri, with a sprinkling of Uighur words that trace their origin to the Turkish language. Before visiting his brother, he worked on learning the language he inherited from his father and he thinks that he is now one of the only two Uighur language speakers in India. “All the people that I met in Xinjiang wanted the freedom we have in India. The sort of protests we see in Kashmir would not be possible there at all. The state would repress it immediately,” he says. “They landed without a visa, with the hope of reaching Mumbai to meet [Bollywood star] Shah Rukh Khan and become rich like Indian movie stars,” says Abdullah shaking his head, his expression a blend of amusement and concern. “Kashmir has a long history of trans-Himalayan migration, because of its connection to the Silk Route,” said Abid Ahmed, editor at the cultural institution, Jammu and Kashmir Academy of Art, Culture and Languages, in Srinagar. The best documented of these migrations is that of the Tibetan Muslims of Srinagar, who settled in Kashmir after the 1959 Tibetan uprising. Rahim’s mother is from Ladakh and he himself has married a Ladakhi. “I try to keep the Uighur culture alive for my children, but it is not easy,” he says, with a tiny shrug. “It was a hard trip. There were no streets. The highest mountain passages in the world are here. Sometimes you had to sit for hours in the snow and wait for the fog to dissolve,” he told Al Jazeera in an email. “When we met human civilisation in Ladakh, in Kashmir, we thought as children that we were in paradise on earth,” said Alptekin, who currently lives in Germany, where he runs World Uyghur Congress, an organisation of exiled Uighurs and is one of the most well-known activists for Uighur independence. Alptekin’s family found a temporary home at Yarkand Sarai, in Srinagar – once a rest house and an international trading hub for traders from Central Asia – Yarkand, Samarkand, Kazakhstan, Bukhara – and Gilgit which is located in Pakistan. “When we arrived in Srinagar, there were a couple of older Uighur families already living in that area,” said Alptekin, who visited Yarkand Sarai again last year. Abdul Hakim’s family is one of the two Uighur families still living near the cemetery. His father, who was from Karghilik, traded in carpets and settled in Kashmir in the 1940s. He, too, had a family from which he was separated across the border. He talked to Al Jazeera over the phone from Ladakh where he was visiting his relatives. “I heard from my mother that he had two children there and a wife and brothers and sisters and he could never meet any of them again,” says Hakim, who works with the state police department. “Our passports were stamped and bags were packed. And we thought we would live with our people there. But, we couldn’t bring ourselves to leave. Our roots are here,” Hakim says.